She wants to interview Jayalalithaa, and in fact do a series some day on women politicians ­— Sonia Gandhi, Mayawati…. As people, she finds them fascinating. We are chatting at her home in a quiet part of Delhi, serene and oasis-like; ideal to get back to after dealing with the news all day long. I was welcomed at the door by her dog Mischief, obviously a favourite of the family, and obviously spoilt by Sonia’s three daughters, whose portraits adorn the wall overlooking the dining table, adjacent to a living room filled with books. For someone who does not particularly enjoy shopping for clothes, she looked graceful in a powder blue outfit. She says she prefers wearing Indian when on air, though her teenage daughter, for whom she is no longer a fashion icon, thinks she should wear torn jeans more! (‘If mausi can wear them, why can’t you?’) And black! She gives her mother tips and is often critical of what she wears. “She does not like me in salwar-kameezes at all!” Sonia laughs. “She keeps me on my toes. I prefer pinks, blues…but she says — black. ‘Be trendy’ is her mantra!” Her younger two daughters however (the youngest is six) still look up to her and have not reached the critical-of-what-mom-wears stage yet. “Thankfully!” she sighs. Sonia confesses to dreading the end of the financial year, because her wardrobe allowance has to be used up by then. But most of the time she ends up wearing her favourites, especially if they happen to be right there, ironed and ready. 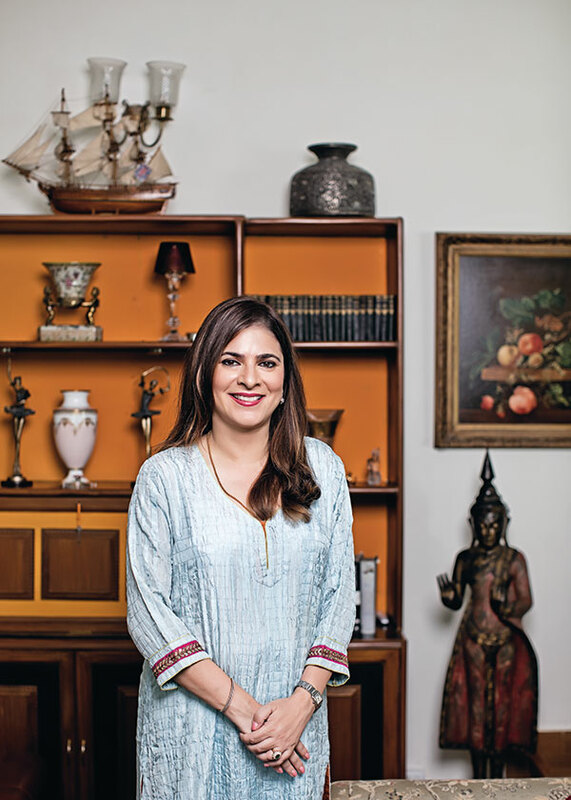 She recalls somewhat sheepishly that when she was presenting a story on Salman Khan, the crew cut to a clip of an earlier interview she had done with him, where she saw to her embarrassment that she was wearing the very same outfit eight years ago. Her team had a field day teasing her about it. Sonia has left most of her saris at her mother-in-law’s residence in Padrauna, UP, where her husband, Congress leader RPN Singh spends half his time. And she tends to wear them when she’s there. She has told her husband that she’d like to get married again to him just to be able to wear different outfits. This time around, she’d probably choose a stunning red Ritu Kumar lehnga instead of the pink one she had worn in 2002. Sonia also unwinds by reading. Glancing at all the books in her living room, she tells me, “I read all kinds of fiction, but chick lit is how I relax, especially the Irish kind. My guilty secret is Maeve Binchy and even though everyone tells me that one is supposed to stop reading her when one is 25, when I’ve had a stressful day at work and I want to know that everything is well with the world, I come back and read her books.” She has recently begun Siddhartha Mukherjee’s The Gene: An Intimate History and recommends it. We might even see a book authored by her some day, but only when she stops working. Having been with NDTV for almost 25 years (2017 is when she’ll complete her silver anniversary with the organisation), Sonia’s initial goal all those years ago was to work as a print journalist for India Today. Their loss, NDTV’s gain? “I hope so!” she laughs.